Google's flagship Android OS is gobbling up market share in every nook and corner of the world, and the story is no different in India as well. Now it's the turn of Android 4.0 based Tablets to take on the world. But, there are no blockbuster Andriod Tabs yet, apart from may be Kindle Fire. Two rather unknown Indian mobile phone manufacturers has just launched their first ever Android Tablets, that too based on Android 4.0 ICS. Both the products have made quite an impression among gadget lovers across the world already. 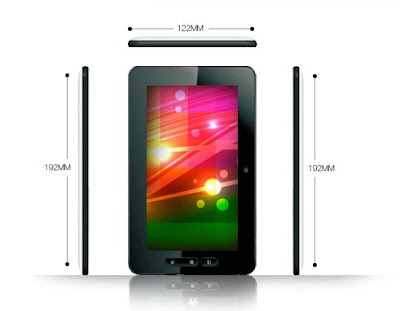 Let's find out what makes these hot new ultra low-cost Android tablets potential blockbusters. First in line was Micromax backed FunBook Android ICS Tablet. Micormax FunBook Tablet based on Android is powered by a 1.2 GHZ Cortex A8 processor with an internal memory of 4GB (32GB of expandable external storage also available) and 512 MB of RAM. It has also got a powerful Dual Mali 400 2D/3D graphics processor. Micormax FunBook runs on latest Android 4.0 ICS operating system. It has got a 17.8 CMs capacitive touchscreen interface with a screen resolution of 800*480 pixels. Wi-Fi support is available along with a Micro USB port, an HDMI port and a front-facing VGA camera. As if to sweeten the deal even further, Tata Docomo 3G Dongle is bundled with the device. Only let down is its slightly under-powered 2800mAh Li-ion battery. Price: INR 6499 (USD 127.00 approx) BUY NOW! *Overseas deliveries not yet available, starting soon as per the website. Karbonn Mobiles is Micromax's biggest competitor in the Indian market. Immediately after Micromax's launch of its first ever Android ICS based Tablet, Karbonn Mobiles made its intentions clear. They are planning to launch an even better spec'd Android 4.0 Tablet in the sub-Rs.10000 ($195 USD approximately) category. Tablet is called Smart Tab 1. 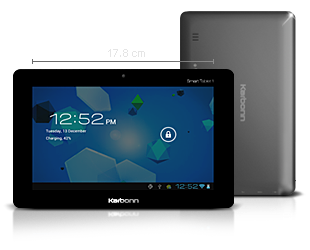 Karbonn Smart Tab 1's specifications are very similar and sometimes even better than Micormax's Funbook Android Tablet. It is also powered by a 1.2 GHz processor, has 17.8 CMs capacitive touchscreen, expandable memory (upto 32 GB), and runs latest Android version 4.0.3 ICS. But it has got a better battery (3700 mAh) and also a 2MP front facing camera, both very important differences as far as an average Tablet consumer is concerned. Interestingly they haven't mentioned anything about GPU or the availability of USB port in Smart Tab 1. But I will be surprised if they are somehow inferior/non-existent. Karbonn Smart Tab 1 is not officially launched, hence the exact price is not available. When you look at the specs (and the price of Micormax's Funbook), it gives you the impression that Smart Tab 1 is another low-cost Tablet in the making. Smart Tab 1 is available for pre-order at the moment. BOOK NOW! If you are looking for an even cheaper Android based Tablet, consider Aakash and UbiSlate 7, both of them priced around $50 USD. Tablet race is only heating up and I believe, low-cost (not cheap) alternatives like Micormax Funbook and Karbonn Smart Tab 1 can play a huge role in popularizing Android based Tablets. Thanks for reading.